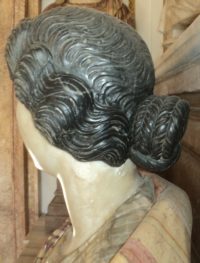 Janet Stephens, intrepid hairdressing archaeologist, was on my mind often as I traipsed through the rooms full of Roman busts in the Capitoline Museums. Her intensive research on Roman hairstyling coming from her perspective as a professional stylist, a unique viewpoint that gave her special insight into an arena most historians know nothing about, led her to fascinating discoveries like that Roman matrons likely had their elaborate braided updos sewn together instead of wearing wigs. 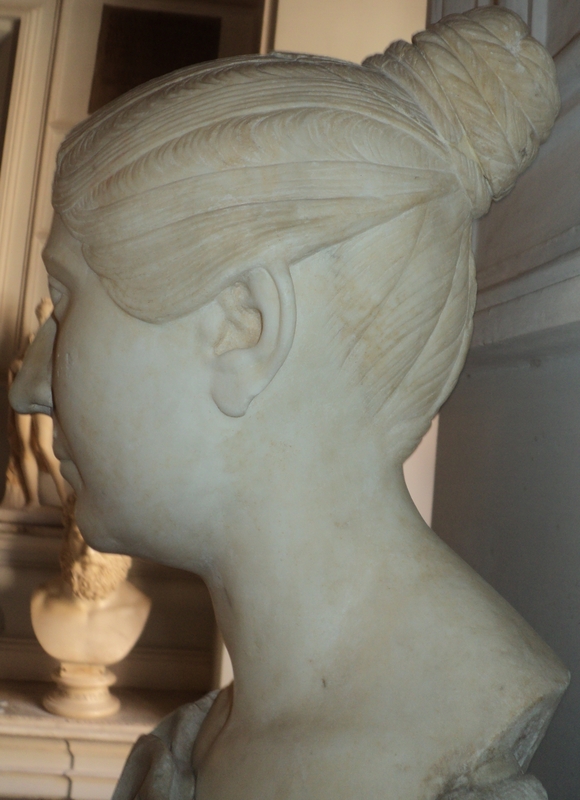 She also unravelled the complexity of the seni crines, the characteristic hairstyle of the Vestal Virgins. 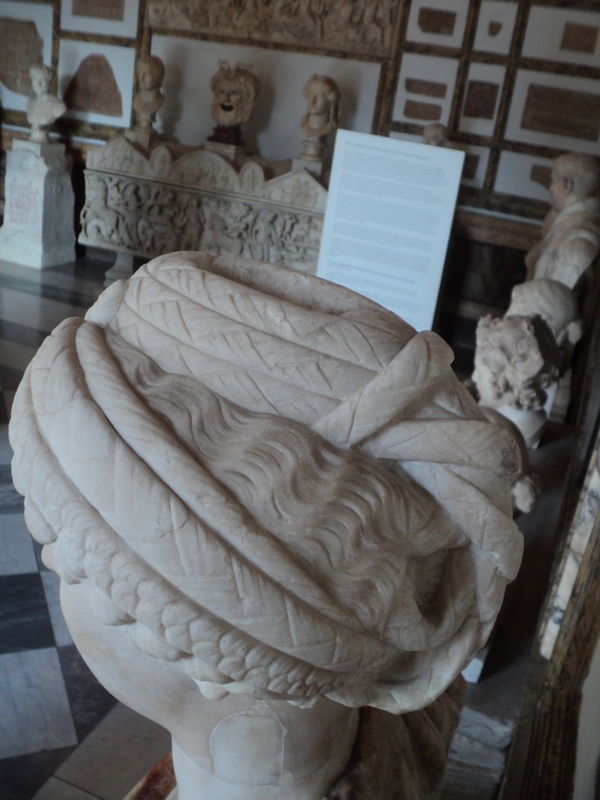 I would love it if all archaeological museums would display their sculptures out in the middle of the room instead of in niches and against walls! And I wish there were mirrors behind every small sculpture displayed in a case. The Capitoline Museums have not made her dream come true, I regret to report. It’s a damn shame because that mirror idea is brilliant. 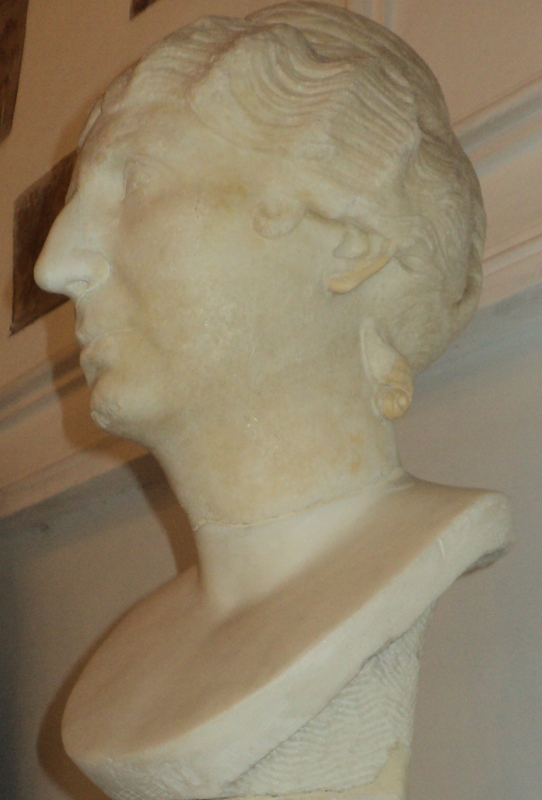 The good news is that even though the busts are still on shelves up against the walls facing the room, many of the female portraits have been turned just enough that you can see the sides and back of their hair. 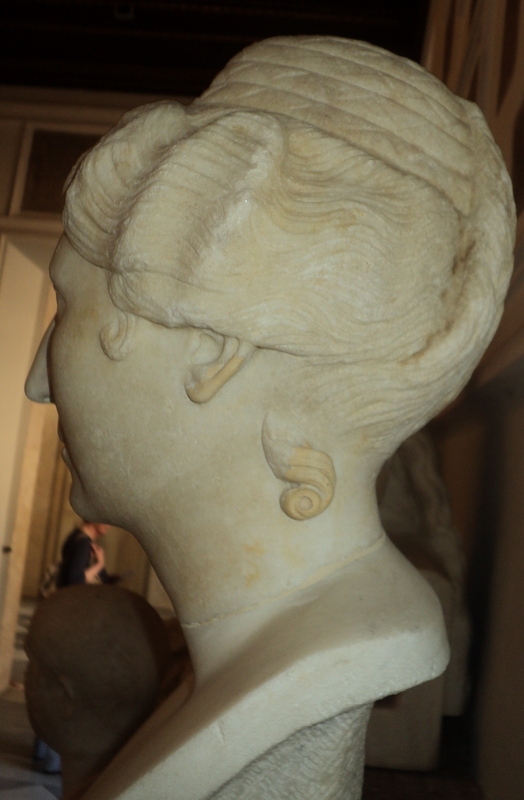 You might have to crane a bit to do it, but it is now possible to see the business end of the Roman women’s hairstyles and even get a pretty decent picture of several of the most interesting ones. Yes, some Stretch Armstronging is required, but nothing too contortionist for single-jointed, non-rubberized people to handle. I looked for hair that I couldn’t recall having seen her recreate on her YouTube channel yet and that had some intricate elements to it. Nobody famous, therefore, because Janet has already done quite a few empresses and society leaders. My final choices range in date from the 1st century A.D. through the 4th, and all these nameless Roman ladies have in common are great ornatrices and fly dos. The last woman’s hair is less complex than some of the others, perhaps, but I found its tiger-striped elegance no less intriguing, so she gets the big embed to show off the fine details. All of these busts were spread out in the ancient marbles gallery, keeping company with some of the famous sculptures of antiquity. 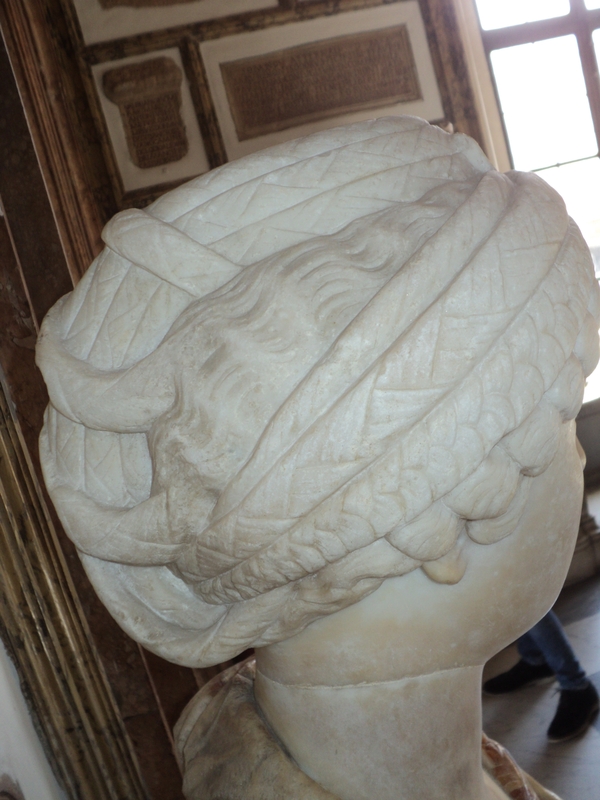 My last post on the Capitoline Museums will cover the big names too. Stay tuned! This entry was posted on Monday, October 23rd, 2017 at 11:34 PM	and is filed under Ancient, Museums, Roma, Caput Mundi. You can follow any responses to this entry through the RSS 2.0 feed. You can skip to the end and leave a response. Pinging is currently not allowed. The last woman’s hair is ‘less complex’ ? Frankly, and just for the records, I developed a little fetish for braided or put-up hairstyles myself, and I can indeed confirm that in most cases the simple ones are the best. Contrastingly, I remember once being invited to a huge Levantine wedding (several hundred people), where -later in the evening- I found myself dancing wild with the bride plus about 15 Levantine girls -yet another fetish- dancing all around us. They ALL had VERY(!) 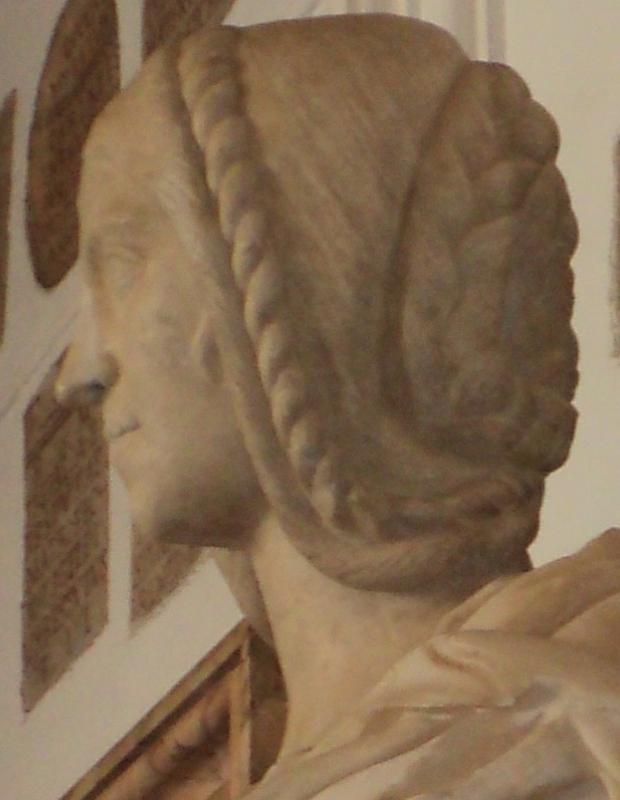 elaborated hairstyles. Unfortunately, very much in contrast to those hairstyles, they were themselves not very tall. Hair two thousand years ago and, thank goodness, still hairstyle today! Great post. 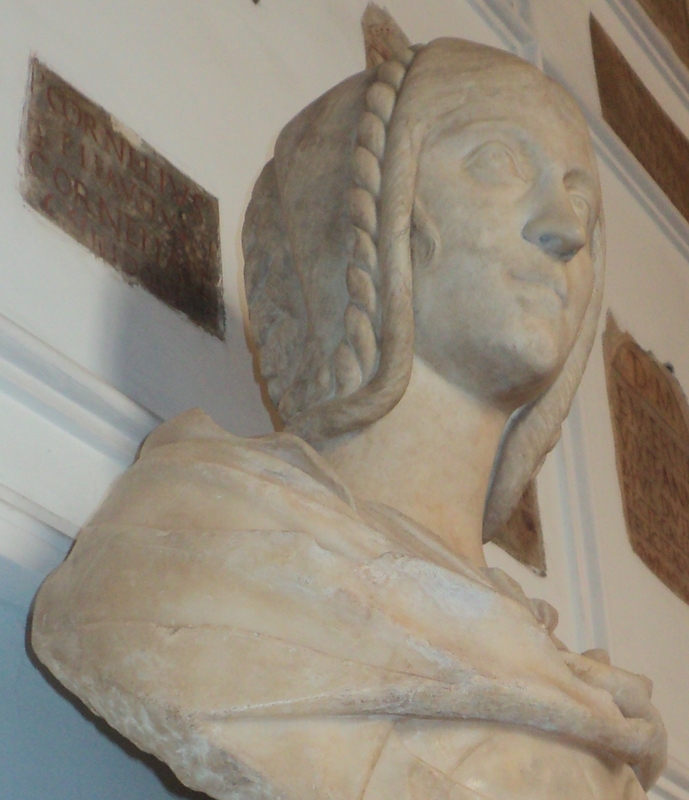 I to have been frustrated by the inability to see the back of headdresses and hairstyles on medieval sculpture. Are the colors on the black-haired woman original or a later restoration? What an interesting subject, thanks! And it doesn’t hurt that Rachael Pietra (the model in the video) is one of the most beautiful women I’ve ever seen. So interesting. Amazing that she figured this out 2000 years later. These statues were painted, originally. We’re used to seeing white marble, but they were an explosion of color. Researchers are now examining artifacts for paint fragments that reveal which colors were worn, and which pigments were used. Neat stuff! 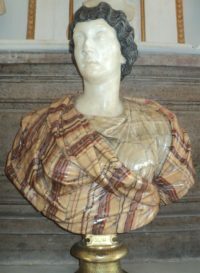 … in this case, however, the colors on the black-haired ‘Lucilla’ seem to be the stone itself, resulting in an almost tartan-like appearance. Of course, that would not mean that her face was not painted. By the way, the socket and that label seem to be younger, even if I can hardly read what’s on there. More ancient hairstyles, these from the mideast. Mostly males. But the Median lady whose hair is wound with pearls has my heart.